The intragastric balloon placement is a procedure under slight general anesthesia applied endoscopically by a gastroenterologist. 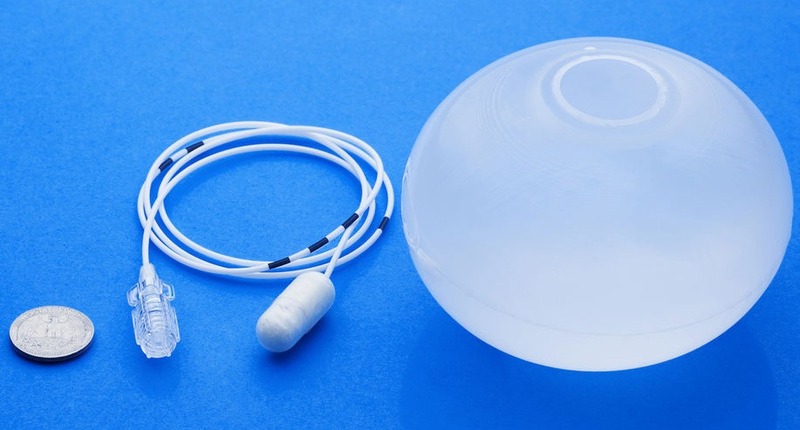 What is the intragastric balloon ? The intragastric balloon is a silicone balloon filled with physiological serum and equipped with a radiopaque valve that can be seen on X-rays. The most common name is the gastric balloon. This particular type of obesity treatment is considered as a non-surgical weight loss treatment. This alternative to surgery is best suited for people with a BMI between 28 and 30 and who have had failed attempts to lose weight by dieting and exercising in the past. Once the intragastric balloon is filled with physiological solution in the stomach, it will create a fullness and satiety and thus decrease the dietary needs. In general, the intragastric balloon occupies a third of your stomach and allows you to continue eating but much smaller proportions. The procedure of intragastric balloon positioning takes place under slight anesthesia. The gastroenterologist will examine your stomach using a video camera and will introduce the balloon deflated by the mouth. When the balloon is positioned in the stomach, it will be immediately filled either with a sterile saline solution colored with blue methylene or with air thanks to a catheter attached to the balloon. Once the balloon is filled, the doctor pulls on the inner end of the catheter and removes it. The balloon has a closing system that prevents leakage of liquid or air. The balloon floats freely in the stomach. It takes less than fifteen minutes to place the intragastric balloon. The patient will remain under control for 1 hour at the clinic. While the balloon is in the stomach, our multidisciplinary medical team, consisting of a gastroenterologist, a nutritionist and a psychologist, will do regular follow-up. During the uncomfortable 2 to 3 days after positioning, the whole team will be reachable by the patient to overcome any difficulty. the first two months, every 15 days the next three months to become weekly again the last month before the intragastric balloon’s removal. The gastroenterologist will consult the patient at the end of a month and then every two months. The patient will follow the indications of follow-up recommended by the psychologist.. Eating or not before doing sports? Since 1980, the DDG center has been involved in a policy focusing primarily on colorectal cancer screening, Diagnosis and treatment of inflammatory diseases, hepatology, The medical treatment of obesity And recently the creation of the IBS (Irritable Bowel Syndrome) group, management of dyspepsia and irritable bowel syndrome.